Judicial Watch president Tom Fitton said in a statement on Thursday that Attorney General Eric Holder is resigning as his group is close to nailing the Department of Justice on Operation Fast and Furious. 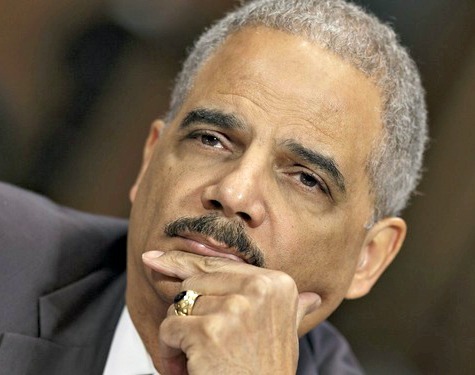 It is no coincidence that Holder’s resignation comes on the heels of another court ruling that the Justice Department must finally cough up documents about how Holder’s Justice Department lied to Congress and the American people about the Operation Fast and Furious scandal, for which Eric Holder was held in contempt by the House of Representatives. Over the past several months, Judicial Watch also exposed how Holder’s Justice Department was implicated in the IRS scandal and how Justice Department lawyers helped defend the illegal stonewall that kept secret key material related to Benghazi. “A Vaughn index must: (1) identify each document withheld; (2) state the statutory exemption claimed; and (3) explain how disclosure would damage the interests protected by the claimed exemption,” Judicial Watch noted in its press release announcing the ruling on Thursday. The U.S. Senate, including many Republicans, ignored Holder’s record and confirmed a man who went on to be one of the worst Attorneys General of the modern era. Mr. Holder, his appointees, and his agency have lied repeatedly to Congress and the American people. He has damaged the Justice Department by putting politics, ideology, and race above the rule of law. Disturbingly, Mr. Holder refused to enforce the law in a race-neutral manner. And, when it comes to government transparency, Holder’s Justice Department became one of the worst violators of the Freedom of Information Act, manufacturing new legal excuses for government secrecy that would make Richard Nixon blush. Judicial Watch has been all over Holder’s actions as Attorney General since he took office, aggressively investigating every scandal and nefarious move Holder has made. Judicial Watch has hit Holder for allegedly lying under oath to Congress about the New Black Panther Party (NBPP) voter intimidation scandal, for backing the White House and GSA decision to not arrest “Occupy” movement protestors who allegedly broke the law, for helping form the legal basis of Obama’s executive amnesty programs for illegal aliens, for sanctioning then FBI director Robert Mueller secretly meeting with Islamist groups, for voting rights issues, for coordinating with ACORN-connected projects, and so much more.